After months of delays, the Mac release of SimCity is just a few weeks away. The ongoing saga of SimCity will get another chapter this month when the troubled Maxis game finally makes its way to Mac on August 29. The city-building sim was released on the PC more than five months ago, and was originally slated to release on Apple computers the same day. The Mac release date was then pushed back to June... and then August, a deadline the developers will hit with two days to spare. When announcing the last Mac delay in June, a blog post from Senior Producer Kip Katsarelis stated it was "because we do not believe it is ready for primetime yet." The team wanted to make sure that the Mac experience was as good as possible, he explained. 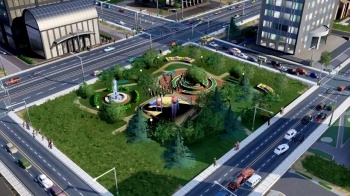 To make up for the delay, developers promised to make the SimCity Launch Park, complete with Edgewater Bay region, available for Mac gamers with their purchase. For faithful PC city-builders, Update 6 was made available last week, providing RCI improvements, additional building height and color variations, and the free Granite Lake region map. As a Mac user, I was looking forward to this for a long time, but it's hard to muster up much enthusiasm so far after the PC release--especially considering how disastrous the first launch was. Then again, maybe getting SimCity six months later will be a blessing--if the gameplay issues are worked out and the always-online factor isn't causing so many problems, perhaps Mac gamers will get to enjoy SimCity without the drama.